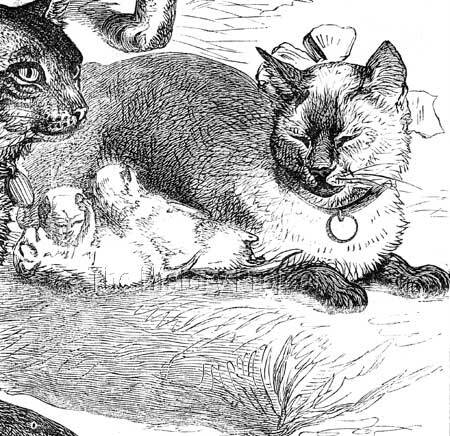 The Siamese, also known as the 'Wichien Maat' or 'Royal Cat of Siam', captured the imagination of Victorian cat fanciers from the very beginning. It tantalised their curiosity with its sinuous lines and seemingly elegant carriage, its uniquely pointed coat pattern and deeply mystical azure blue eyes. 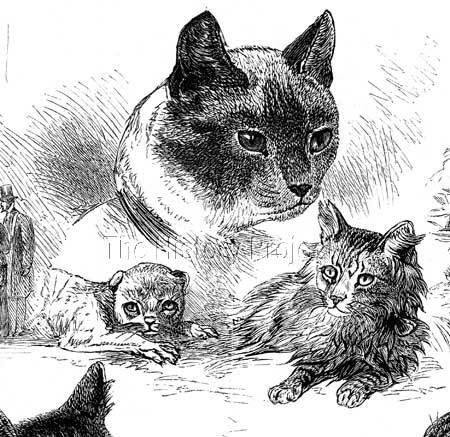 The story of 'Mymie' is singularly unique as she is the very first named Siamese cat for which there exists three key elements - evidence of ownership, an illustration, and confirmation that she was shown at The Crystal Palace as an adult aged 5 years, with her own progeny, in 1875. In the heady days of the pre-registry era, and before other famous importations occurred, among the earliest names associated with the importation of Siamese cats were Lady Dorothy Nevill, The Duke of Wellington, Mr. Scott, Mr. Maxwell and Mrs. Cunliffe Lee. It is worthy of note, that in his chapter on Siamese Cats, Harrison Weir leads the chapter with an illustration of a Siamese owned by Mrs. Cunliffe Lee, and speaks first about the Siamese cats owned by Lady Dorothy Nevill, on her estate at Dangstein, near Petersfield. "Among the beautiful varieties of the domestic cat brought into notice by the cat shows, none deserve more attention than 'The Royal Cat of Siam'. In form, colour, texture, and length, or rather shortness of its coat, it is widely different from other short-haired varieties; yet there is but little difference in its mode of life or habit. I have not had the pleasure of owning one of this breed, though when on a visit to Lady Dorothy Nevill, at Dangstein, near Petersfield, I had several opportunities for observation. "I noticed in particular the intense liking of these cats for 'the woods' not passing along the hedgerows like the ordinary cat, but quickly and quietly creeping from bush to bush, then away in the shaws; not that they displayed a wildness of nature, in being shy or distrustful, nor did they seem to care about getting wet like many cats do, though apparently they suffer much when it is cold and damp weather, as would likely be on account of the extreme shortness of their fur, which is of both a hairy and a woolly texture, and, not so glossy as our ordinary common domestic cat, not is the tail, which is thin. Lady Dorothy's ownership of Siamese at Dangstein is corroborated by Guy Nevill in his biographical sketch of her life "Exotic Groves" which centres largely upon that period when she lived on the vast estate at Dangstein between 1850 and 1878. 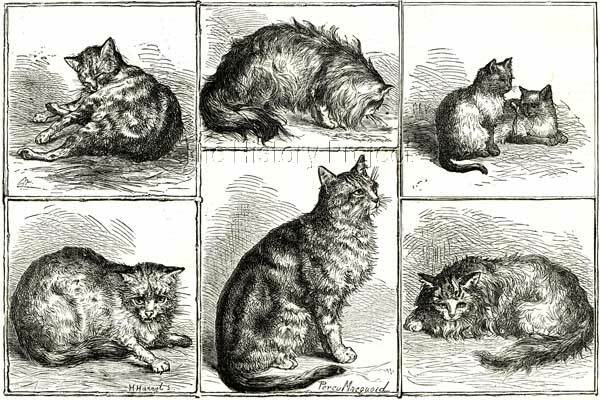 Exhibits at the first Crystal Palace Cat Show, 13th July 1871. Bottom left: The Duke of Sutherland's 'Wild Cat'. 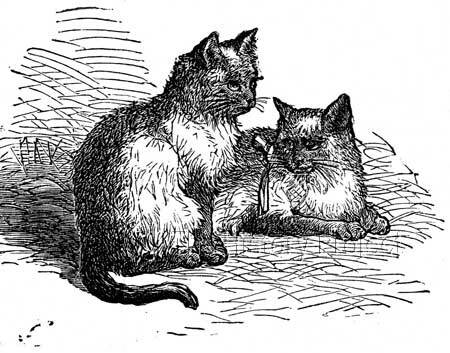 Interestingly, although we have no names for the two cats shown above, a distinct possibility as to who they may have been arises when we survey two separate reports on the Crystal Palace Cat Show in October 1875. What we do know from the report is that they were owned and exhibited by Mr. Maxwell. 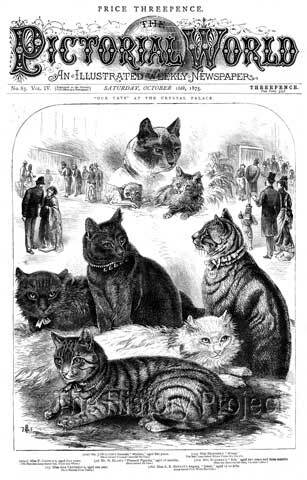 He is again the successful exhibitor of Siamese at the Show of 1875, amongst the patrons of which were both Lady Dorothy Nevill and Mr. Charles Darwin. On this occasion, 323 cats were exhibited. Although the name of the cat is different, 'Mymie' versus 'Myrriee', the breed is the same, the ownership is the same, the award is the same and at the same show. This is therefore one and the same cat, with one name erroneously reported. Both reports corroborate on the fact that the exhibit was 5 years old, which puts her date of birth at 1870. This therefore makes 'Mymie' the first clearly identified named cat, for which there is a named owner, more than one illustration, and confirmation of a show win at the Crystal Palace. Sadly, although we have two Siamese owned by Mr. Maxwell, and an illustration that confirms them as the first Siamese exhibited at the very first The Crystal Palace Cat Show, we do not as yet, have any evidence of their names. 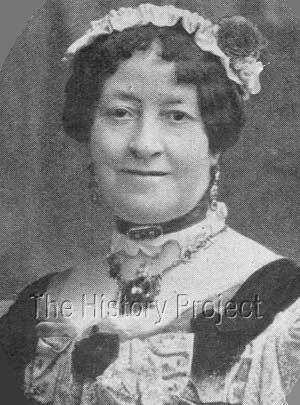 Conversely we have evidence of Lady Dorothy Nevill's Siamese female, 'Mrs. Poodles' being exhibited at the Crystal Palace and gaining a major win, but no illustration. 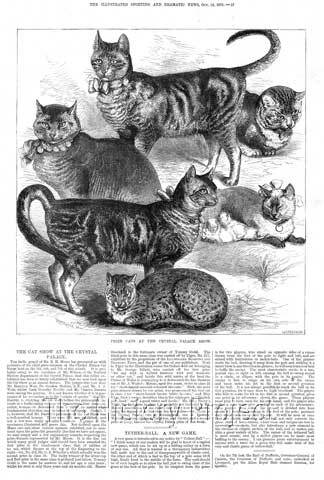 Although the illustrations do show 'Mymie' with a litter of kittens, there are no official records or commentaries which can confirm whether any progeny were retained and successfully bred from. As is so often the case with looking back into historical events where there is initially what appears to be a paucity of information, new facts emerge over time, as new sources are found and corroborative evidence slowly emerges. Sometimes those facts have always been there, but are waiting to be rediscovered. This is certainly true of the history of the Siamese cat and its foundations in England and its mercurial spread abroad, to all corners of the globe. This is a glowing recommendation of Harrison Weir's talents and abilities. We are fortunate indeed that he drew as many of the earliest Siamese as he did, including cats owned by Mrs. Cunliffe Lee and Lady Vyvyan. It is largely due to his 19th century Herculean efforts to promote the cause of the cat, that we have a vibrant and diverse cat fancy of today. But it is equally important that we do not discard or fail to remember the first steps taken in the process to develop that wonderful hobby, which we so much enjoy to this day; nor indeed, the reason behind it, which is to celebrate the divine, in the embodiment of the beautiful creature known as 'The Cat'.